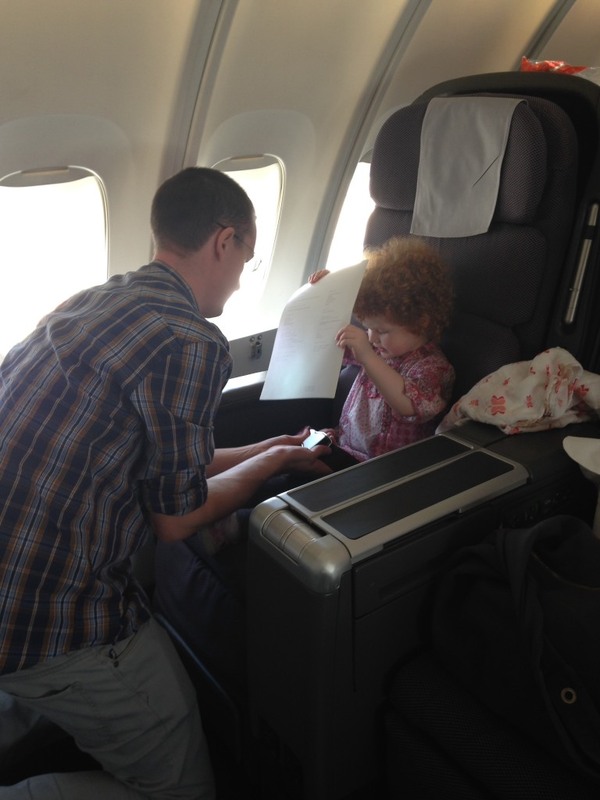 I’ve flown Qantas QF127 to Hong Kong for work several times over the last couple of years, but travelling with my other half, new baby and 3-year-old was quite a different experience – I was still working on the flight, but in a completely different way – and far more intense! Reviews of QF127 flying solo are here (A380 Business Class) and here (747 Premium Economy). But booking and flying with kids is a whole different ballgame. This Sydney to Hong Kong leg was booked with Qantas points on Qantas.com – a Classic Award for my other half and two daughters, and an Any Seat Award for me. The total cost was 180,000 points – 60,000 points per person and only taxes charged for the infant. 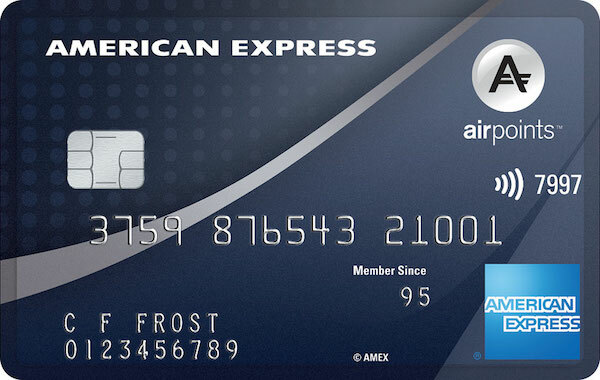 Points were accrued roughly equally from credit card spend, a couple of sign-up bonuses over the previous year and from flights. Once the booking was made, I got onto seat allocations which involved linking our bookings. This flight was on the twice-a-week 747 service, in which the Business Class cabin has bassinets at the front of both the upper and lower deck cabins. 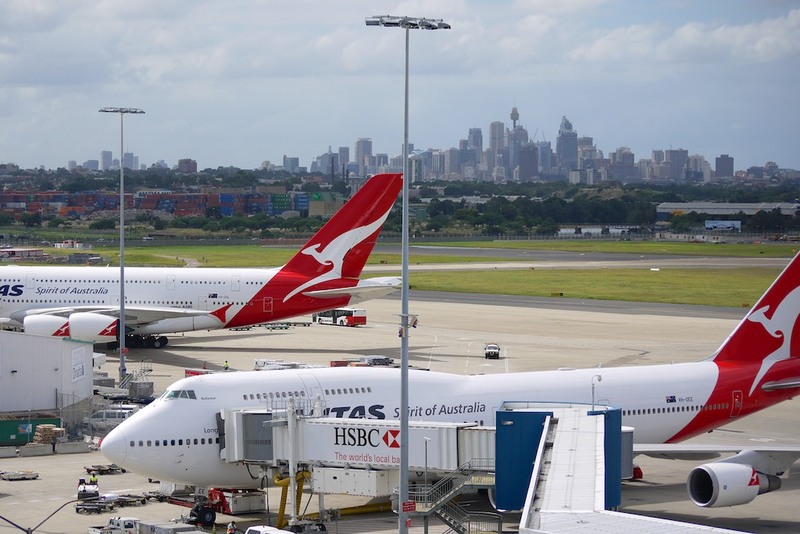 Having flown on the upper deck a few years ago with our eldest daughter from Frankfurt to Singapore, I knew what to expect and on phoning Qantas I was pleased to be offered the Upper Deck again. Given this was around 6 months before the flight, I assume they allocate this upstairs bassinet first and the downstairs after – downstairs is closer to First Class with greater risk of disturbing those passengers, but in my opinion the upstairs is a better position for the traveller. Upper deck passengers are allowed to roam both upstairs and downstairs, while lower deck passengers have no excuse to go upstairs. It gives those travelling with children a little more scope to move around the plane, especially if the kids are acting up – you can explore downstairs, including the galley with some snacks laid out and some windows to look out, before heading back up. After an absolute nightmare of transport logistic problems getting us to the airport, we rocked up at the Qantas International Business Lounge in pretty good time, with just 1/2 hour or so before we should be heading to the gate. 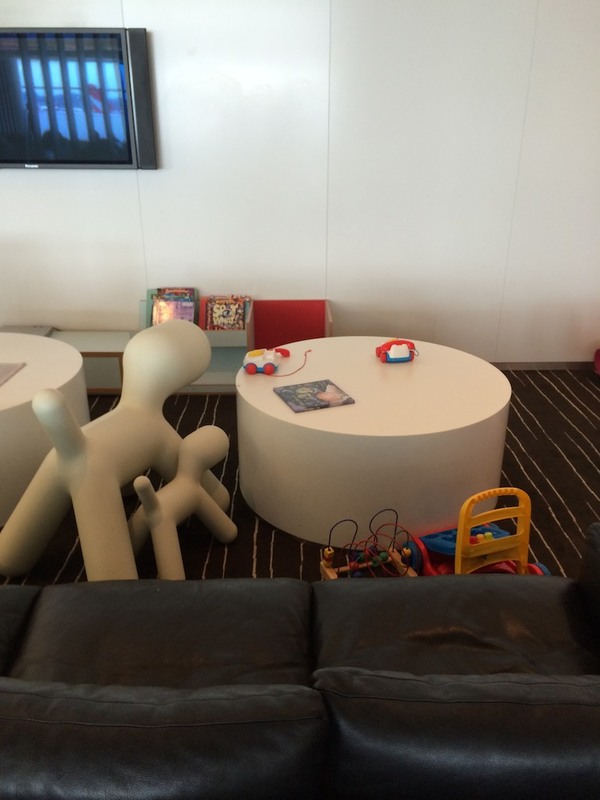 Lounge access is, as you can imagine, very helpful when travelling with kids. When you’re pushing/carrying/dragging them along and all the stuff you inevitably carry for them, it’s a godsend to have comfortable seating you don’t have to fight for, a choice of food and drink that you don’t have to queue (or pay) for and clean bathrooms… all these conveniences take on extra value when you’re juggling children. Not having needed it before, I vaguely remembered there was a kids area up in the far left hand corner of the lounge, so we wandered up to see if the four of us could make ourselves at home. It’s definitely helpful to give some delineated space where kids are welcome – although the furniture and toys on offer were nothing special, and the low level iMacs that could be set to blare out YouTube videos for kids (yes, other parents did this) were annoying. However, it’s worth parking yourself there if you’re travelling with kids under 5 or 6 years old. At this point I checked in on our booking again with the lounge staff – when looking online the day before, the 4th seat in the front row (11A) of the Upper Deck was showing as empty and remained so through check in and in the lounge. We were hoping for a less than full flight, giving four seats for the four of us and not having to annoy someone else sitting next to us. Turned out we got lucky! Our seating choice was definitely the right one, as we boarded and indeed did have the whole of the Upper Deck row 11 to the four of us. I felt that the food and service were as I’d expect from Qantas, just friendly and attentive enough, without being over the top. When travelling with family and infants/kids in tow, I’ve experienced two kinds of Qantas crew – those who are nice but don’t really acknowledge in any particular way that you’re travelling with kids, who just get on with their usual job, and then those who will go a bit out of their way to help further than usual, understanding that parents have a bit more on their plates than the solo traveller. This flight had more of the former than the latter, but I think as long as there are one or two sympathetic crew around it goes a long way to helping the flight go more easily. The bassinet location at the front of the Upper Deck cabin is in a good spot, although on these ageing, non-refurbished 747’s the bassinet itself was getting a bit long in the tooth. Proximity to a bathroom can be such a headache with a baby – firstly because the foot traffic going past as well as the bright light can be disturbing and secondly if the bassinet is attached to a wall panel that’s shared with the bathroom then every flush and door bang shakes the bassinet… not the best for a sleeping baby. The single upstairs bathroom was not used much, and when used didn’t impact on the sleeping baby – and given that there’s little need for anyone to go up past your seat other than to the flight deck, it’s a fairly quiet spot – definitely more so than downstairs. The seat, the Skybed Mk1, is also not the best and not competitive on the overnight flight returning from Hong Kong to Sydney, but during the day on QF127, is passable. The best thing about the Skybed layout (Mk1 or the new lie-flat Mk2 seats on the A380 and refurbished 747’s) is the fact they are side by side – solo travellers would prefer the newer herringbone or staggered layouts, but for a family travelling in Business Class side by side is ideal – no. 1 daughter was easily in arm’s reach. The food was pretty decent, but actually almost exactly the same menu as I’d had a couple of months prior. We were offered online meal selection before departure which worked well with our hands full, and relieved of us of one thing to think about. The crew were perfectly happy to stagger our meals as required too. As I’ve mentioned, this flight was operated using an old Qantas 747 so the in-flight entertainment system was fairly average. Although I didn’t realise it at the time, the availability of local children’s TV / movie programming is a small blessing compared to foreign carriers – travelling with Cathay Pacific and Malaysia Airlines later in the trip we had fewer English selections and unfamiliar kids programs, making an easy selection a bit trickier. The Qantas kids activity pack contained with a luggage tag, colouring book, coloured pencils, pencil sharpener and small magnet drawing board. It didn’t hold our 3 year old’s attention that long, but was fine. I had selected this flight carefully from a few options (Cathay, Virgin Atlantic and Qantas were all available on points), due to the specific timing, service and seating factors I knew would work well for us – so it was satisfying that this flight went off without a hitch. Factors out of our control – delays, the attitude of other passengers, no. 2 daughter’s reaction to her first flight at 3 months old, etc – weren’t an issue on the day. I’ve always found other passengers flying Qantas, including those in Business Class, to be sympathetic to parents travelling with children, and Qantas crew to be pleasant enough to deal with in the same instance too. Kudos to my fellow Australians, I hope I’m not alone in my experiences here! The Old Clare Hotel is the only Design Hotels property in Australia that’s linked to Marriott, allowing you to use/earn points or status. 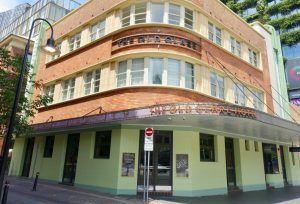 It’s a unique place and definitely recommended for those looking for a different Sydney experience.